I was very fortunate to be given a copy of the "Food Matters" documentary recently, and I will tell you that it absolutely and instantly changed everything about my diet and lifestyle. I knew I had to eat better, but I didn't know how. I didn't understand what was wrong with my diet, which I thought was actually pretty good until I was enlightenned by Food Matters. I strongly, strongly suggest that everyone purchase and view a copy of the documentary. I make no money whatsoever from my recommendation. 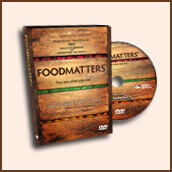 Visit www.FoodMatters.tv to purchase your copy. It will be the single biggest step on your path to improving your health and combatting all illnesses.